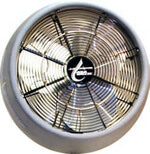 The Wall Mount Misting Fan can be used in cases where floor space is not available. It is no different than the portable unit and can be installed virtually anywhere. Use this system with a separate pump station depending on how many outdoor misting fans you require. The Pump Station is to be used with the wall mount fan heads. Choose from three different models depending on your needs. Up to 11 outdoor misting fans can be run off a single pump unit if selecting the largest capacity pump. Comes complete with pump, motor and filtration system. The AquaBreeze Cooling System is proven to reduce the ambient temperature, even in high humidity climates. Evaporative cooling works any time you are able to achieve evaporation. The faster and more complete the evaporation, the more effective the system will work. Areas above 80% relative humidity can see temperatures drop up to 10ºF. For humidity levels between 40% and 80%, temperature reductions will be as high as 20ºF. And areas with low humidity can achieve the highest drop in temperature, as much as 35ºF. Cooling solutions for sport events, farms, parks and more.